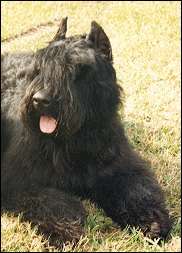 History of CAM Kennels - CAM Kennels welcomes you to quality bred Bouvier des Flandres. We have shown, raised, and loved Bouviers (a fabulous breed, great family dog and protector) for nearly 30 years. We are breeders of Bouviers striving for good health and great temperaments who conform to the AKC Standard. When Charlie and I first married many years ago we owned a darling Fox Terrier. She lived to be 13 years old. I did some obedience work with her but never on a competitive level. As the years went by we owned a couple of other small dogs including one mixed breed dog named Tuffy that lived to be 15 years old. We also owned Quarter Horses. My sons showed their horses in 4-H and I showed some in open shows. I have raised and trained many horses through the years. My life revolved around my love for horses until one day, more than 25 years ago, Charlie made the announcement that he wanted a large dog. Since I was only used to the small dog I wasn't sure I wanted the responsibility of owning a large dog. I was determined that if we were going to get a large dog we had to work at finding the right breed of dog for us. After spending a year researching, reading about the different breeds, going to dog shows, and talking with breeders we finally decided the Bouvier des Flandres would be the perfect breed for us. 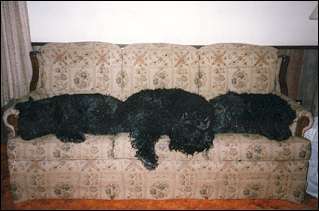 In January 1988, we purchased our first Bouvier, Ch. Oscy's Tanandabear of Sunset (pictured here), from the Sunset Kennels owned by Louis and Ada Van Ryswyk. Tana was everything I was afraid of in owning a large dog. She was independent, protective, and challenged my leadership position. And that was when she was only three months old. I spent many sleepless nights those first few months worrying about what we had gotten ourselves into. She was too much dog for us, so it seemed. I knew I needed help so I read some books on training and raising dogs and I enrolled her in obedience classes. Through the course of training Tana, I discovered how very smart she was. I also discovered how devoted she was to me. She loved to work. It was a joy to watch her enthusiasm to learn. One time when I gave her a command that I had taught her the day before (heal from a front position), I actually saw her think through the command and remember what it meant. I could see it in her eyes and body language. I could see the confusion at first, the thinking it through, and then the "Oh, yeah, now I remember!" look in her eyes, at which time she got up, walk around me, and sat in heal position. Then she looked up at me as if to say, "Did I do it right?" It is the most amazing thing to watch a dog think through a situation and come up with a solution. As Tana matured and I learned more about her, I came to love her independence. 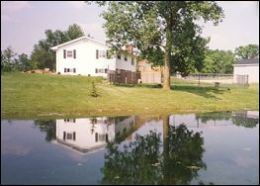 After all, how better to say ,"I love you" than to make those choices to obey when you would rather do your own thing. I knew that when I asked Tana to come, or anything else for that matter, she was coming out of choice - not because she was a robot dog that did everything she was told. I felt safe with her protectiveness because I knew if I ever needed her she would be there to protect. She knew when people were invited into the house, they were guests and she was quite friendly. But one time when a stranger came in our house uninvited she was there to put that person in the corner. And I grew to love and respect her "top dog" attitude that helped her in the end when she became very sick with cancer, to maintain her self respect. She was always a proud dog. I have so much respect for her. There will never be another Tana. She has been without a doubt the best dog we have ever owned. She taught me so much. When we were looking for our first Bouvier our intentions weren't to find a show dog. However, when we got Tana the Van Ryswyks encouraged us to show her. Since I had shown horses, showing dogs seemed like a natural progression. Thus started our dog show career. And once I got started showing dogs, I was hooked. To be honest, with the rough start we had with Tana I wasn't sure I ever wanted another Bouvier, but my husband and youngest son did. So we ended up with our second girl, Ch. Mercedes of Sunset, ( a.k.a. Sadie). Sadie was born with manners and very obedient from the beginning as a puppy. I started taking her to school with me and she was great around the young students in my classroom. I also did obedience work with her and she earned her Companion Dog, and Companion Dog Excellence Titles, along with the Temperament Test Certificate and Herding Instinct Certificate. She earned the Well Rounded Bouvier Title. Then we got our third Bouvier, Ch. Monique Nicole of Sunset, - sweet, lovable, sensitive, kissable Monique. I began to realize that the Bouvier des Flandres was the perfect breed for us. We didn't decide to become breeders until six years after getting our first girl, Tana. By this time we owned three Champions and I had lots of experience with training the Bouvier. 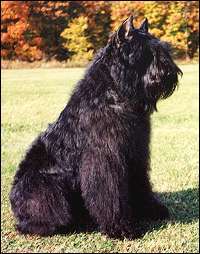 With reading several books about the Bouvier, about training dogs, and about breeding along with studying pedigrees, I began to feel confident with breeding good, healthy Bouviers with stable temperaments. Out of our first litter there were three Champions, Am./Can. CH Cam's Ricca Shea Ryder, Am./Can. CH Cam's Montana Ghost Ryder, and Am./Can. CH Simone of Nite Ryder. We owned and raised CH Cam's Ricca Shea Ryder. She was very much like her mother. Very sweet, lovable, kissy with a hint of independence -- actually she was our lap dog - whenever there was a lap, she wanted to be in it. Shea lived to be almost 16 years old. CH Cam's Jack Hammer, Jack, won Best of Winners and an Award of Merit at our Michigan Regional Specialty when he was just 7 months; which also was his first AKC show. Jack began his AKC show career with a five point major and then finished his championship with a five point major. CH Cam's Little Rock, Arkie, won First Place in the Bred By Exhibitor Class at the 2003 National Specialty under Judge Michelle Billings. I have shown three dogs from the Netherlands, Am./Can. CH Aram-Donny VD Lage Banken and Am./Can. CH Qucady-Xavjenna VD Lage Banken and CH Yoscano-Gingy VD Lage Banken. One of my most memorable times with the Bouviers was when I had the opportunity to visit the Lage Banken Kennels and the Dafzicht Kennels in The Netherlands. That was when I showed Aram at the Dutch Specialty and we came in Second in the Breeder's Class out of 34 dogs. This was after I showed him here in the U.S and Canada. Am./Can. 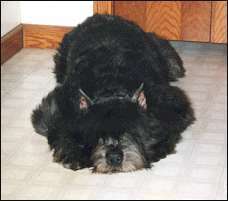 CH Cam-Marlee's Roar Of The Tundra, Roadie, who is co-owned and handled by Myra Roth from Ohio was the Number 1 male Bouvier in the Nation in 2003 and 2004. Roadie is a Multi-Group winner and Multi-Best in Specialty winner, winning (among others) Best in Specialty at the 2004 National Specialty. As a young dog he won 6 Best in Sweepstakes. He also won Best of Opposite at the 2003 Westminster show in New York City. We are extremely proud of Roadie's accomplishments. Our best litter was out of Crystal and Roadie. She had 9 puppies and 7 of them became Champions, four of them finished before they were 2 years old. Keeli won 3 majors out of the puppy classes. Brody was shown only in three weekends at shows and finished both his American and Canadian Championships. He went to the Timonium, MD show and picked up a Best in Sweepstakes and a Best of Opposite in Sweepstakes plus 9 American points. Then he went to the Sault Ste. Marie shows in Canada and earned his Canadian Championship winning Best of Breed over the Specials plus a Group 1 and a Group 2. Then he went to the Kalamazoo shows and won a four point major to finish his American Championship. Das was exclusively shown by is owner/Jr. Handler, Dareth, which was her first experience with showing dogs at AKC and CKC events. At the 2005 National Specialty Dareth won Best Junior Handler and Best Dog in Futurity showing Das, her first time showing a dog at a National Specialty. Astro won Best Puppy at the 2003 National Specialty, the same year his daddy, Roadie, won Best in Specialty at the National. Then there's Derringer, a Roadie grandson, AKC/CKC/UKC & International Champion Cam's Derringer, ended the year 2011 Number 8 in the Nation in Breed Points and Number 12 All Breed. And he was shown exclusively by me. What an amazing dog and so much fun to show. And Rozi, AKC, UKC INternational Ch. Mapleridge Shades Of Heaven. Julienne, AKC and International Champion Cam's Julienne de Rana, with Puppy Best In Show wins, aka the Wild Child! Izzy, calm and sweet, loving Cam's Isabella Roze who hated to be shown. Paisley, becoming my heart dog. Such a gentle dog and so very sweet, loves to go to obedience. And many more Bouviers that have shared their lives with us. When we were first looking for a family pet and investigating the breed so many years ago, I asked Louis Van Ryswyk, a long time Bouvier breeder with the Sunset Kennels, about the Bouvier. His response was, "Once you own a Bouvier, you will always own a Bouvier." I thought, spoken like a true Bouvier Breeder, he's just prejudiced. And now, that is exactly how I feel. I love the Bouvier! I love the independent thinking ability of the Bouvier. I love the feeling of being protected by a very intelligent dog capable of deciphering friend from foe. I love the strength of the Bouvier and the belief that the Bouvier can take charge when needed. I have to laugh at their antics and manipulative abilities when they are trying to get their way. And guess what, I will always own a Bouvier! Plus all the other Bouviers bred by us that are living in loving homes.